The Brazilian franchising market is growing again. The second quarter of 2018 has seen growth at a rate of 8.4 per cent compared with the second quarter of 2017. Currently this market comprises approximately 2,800 franchise networks, generates around 1,224,987 direct jobs and annual revenues of 163 billion reais, and has achieved an advanced level of maturity and reliability on a global scale. Native Brazilian brands represent around 94.8 per cent of the networks in operation. The maturity of franchising in the country, along with the strengthening of Brazil's social, political and economic environment, has resulted in strong interest in the internal market from foreign brands and also incentivised local brands towards expansion into international markets. Currently, 200 international franchise networks from 26 countries operate in Brazil. This still represents only 7 per cent of the operating franchises in Brazil, although there is growing interest in the Brazilian market, which with strong domestic demand from a population of more than 190 million people offers attractive prospects for companies seeking to augment the volume of their business. Additionally, there are currently 129 Brazilian franchised trademarks operating in 62 foreign countries. Founded in 1987, the Brazilian Franchising Association (ABF)2 is a non-profit entity that has as its objective the contribution to, promotion of and striving for technical and institutional development of the franchise system. With its national headquarters located in São Paulo and a branch in Rio de Janeiro, ABF has established itself as the most representative entity for the sector at the level of federal government and in other administrative spheres, and in relation to official national and international entities. ABF has more than 1,000 members, including franchisers, franchisees, consultants and sector service providers, and it also participates in the Ministry of Industry, Foreign Trade and Services (MDIC) Project for the Elaboration of the Economic Development Plan. Brazilian law does not impose any specific restrictions on foreign franchisors granting franchises in Brazil. The only requirement is that the franchised trademarks are registered with the Brazilian National Institute of Industrial Property (INPI). There is no requirement of prior local registration for the franchisor entity or the franchise template documents. However, as will be further explained, foreign franchisors must comply with certain applicable local laws. With a few exceptions, foreign franchisors can own equity interest in Brazilian companies, provided that they appoint an individual who is resident and domiciled in Brazil as their attorney-in-fact, with powers to receive summonses on their behalf and manage their equity participation, among other things. Any prospective foreign partners or shareholders in a Brazilian company must first register with the National Taxpayer Registry for Corporate Entities or the National Taxpayer Registry for Individuals, as the case may be, and with the electronic registration system (CADEMP) of the Brazilian Central Bank. Certain sectors have specific restrictions on the participation of foreign investors, such as health services, coastal shipping, media companies, cable TV, mining and hydraulic energy, rural land ownership in frontier areas, nuclear energy, public air services and the aerospace industry. In general terms, a foreign franchisor is allowed to own real property in Brazil, although certain restrictions and specific governmental approvals set out in specific legislation may be required for rural or border areas in certain cases. The franchisee shall collect withholding income tax (IRRF) on behalf of the franchisor, although the financial burden for this tax may be shifted contractually. The tax is levied at general rate of 15 per cent of the amount to be remitted, but this may be higher or lower depending where the franchisor is resident or domiciled. If the franchisor is located in a low-tax jurisdiction, the applicable rate is 25 per cent (according to Brazilian legislation, a low-tax jurisdiction is one that does not tax income or taxes it at a rate lower than 17 per cent; or one whose legislation does not allow the exchange of information related to corporate shareholding and ownership or identification of the actual beneficiary of the income attributed to non-residents). Those jurisdictions considered low-tax jurisdictions have been listed by the Brazilian Federal Revenue (RFB) in its normative instructions. In contrast, international tax treaties may apply to the parties involved in the franchise transaction, granting advantageous treatment in relation to IRRF taxation. As a rule, the Contribution for Intervention in the Economic Domain (CIDE) is due and payable by the franchisee and calculated on the royalties paid to the franchisor, at a rate of 10 per cent on the amount remitted. There is a question as to whether these taxes, known as PIS-Import and COFINS-Import, apply to international franchising, given that, as a rule, the RFB considers them not chargeable on royalties remitted abroad, unless those royalties actually derive from services provision. As a matter of fact, according to the Response to Formal Consultation No. 480/2017, issued by the RFB tax authorities, these contributions must not be levied on international franchise agreements, but this recent opinion goes against a prior position on the matter. In the previous scenario, PIS-Import and COFINS-Import were considered contributions that would be payable by the franchisee, calculated on royalties paid to the franchisor (before IRRF) plus service tax (ISS) and the contributions themselves. In general, the applicable rates are 1.65 per cent and 7.6 per cent, respectively. If the master franchisee adopts the actual-profit method to determine the corporate income tax and the special contribution on net profit (CSLL), a tax credit equal to the amount of PIS-Import and COFINS-Import may be granted to the master franchisee to offset debt relating to the contributions levied on gross revenues (PIS and COFINS). As with PIS-Import and COFINS-Import, it is not explicitly stated whether ISS applies to international franchising, but as a rule ISS is chargeable on services imported from abroad and, according to ISS legislation, franchise agreements are treated as service provision. Therefore, according to municipal tax authorities, royalties paid to local or foreign franchisors are subject to the levy of ISS. The ISS taxpayer is the franchisor, but if the franchisor is a non-resident, the master franchisee shall withhold this tax (as with the IRRF levy, the financial burden for ISS may be shifted contractually). The applicable tax rate ranges between 2 and 5 per cent, depending on the municipality in which the master franchisee is based. Our interpretation is that this tax should not be applicable to royalties arising from franchise agreements, but the matter still has to be analysed by the Federal Supreme Court, especially in relation to the judgment in Extraordinary Appeal No. 603136. The tax on financial transactions (IOF/Exchange) corresponds to 0.38 per cent of the amount in Brazilian currency exchanged into a foreign currency. This tax is payable by franchisees who purchase foreign currency. This is an issue that affects local franchisees. Assuming that the franchisee determines its taxable income based on the actual-profit method, as opposed to estimated profit, the expenses incurred from payment of franchise royalties are deductible. However, this deductibility is subject to certain limitations. According to Brazilian legislation, the limitation of fiscal deduction for franchise royalties should be the combination of the limit for the trademark licence (1 per cent) plus the limit for know-how, which may vary from 1 to 5 per cent, depending on the predominant activity of the franchisor. In any event, the ceiling for fiscal deduction cannot exceed 5 per cent of net revenues. Notably, and solely for the purposes of CSLL determination, line 99 of Appendix I of Normative Ruling No. 1,700/2017, issued by the RFB, provides that, in general, the sole condition for deductibility of royalty expenses is the customary necessity of the activities usually performed by the payor. The question arises therefore as to whether the above-mentioned ceiling would apply in the case of CSLL calculations. Considering that this rule is very recent and is not yet implemented by law, we believe a formal consultation with the RFB on the matter should be undertaken if the franchisee intends to adopt this position. As a general rule, Brazil is a first-to-file country with regard to trademarks. Also, under Brazilian law, proprietorship of a trademark arises with registration, which is of utmost importance for enforcing trademark rights in the country. Hence, before entering the Brazilian market, it is advisable to run a trademark search within the database of the INPI to check for potential conflicts. A trademark search is particularly important in Brazil if the title-holder intends to use the mark before a final decision by the INPI. Although the INPI has significantly reduced its backlog in the past couple of years, a trademark application still takes around 18 months to be decided. Given this time frame, searches become an important tool to assess potential risks in the country and guide possible investments. Also, in an exception to the first-to-file rule, Brazilian law recognises priority rights for senior local users who can prove bona fide use for at least six months before the filing of the conflicting third party's trademark. Unfortunately, given the size and economic particularities of the country, it is very difficult to conduct a wholly reliable use search in Brazil. In addition, while Brazil has adopted the International (Nice) Classification of Goods and Services system, there are still registrations featuring Brazil's former classification system of 41 classes. Furthermore, although the INPI has adopted the latest 45-class edition of the Nice Classification, applications filed under the previous editions have not been updated and coexist with current registrations. The coexistence of these different classification systems and editions of the Nice Classification may be particularly problematic with respect to restaurant and hotel services, an area of significant importance to the franchise business. Despite advanced discussions within the Brazilian Congress, Brazil is not yet a member of the Madrid System, so trademark applications must be filed directly with the INPI. Nevertheless, Brazil is a member of the Paris Convention, so it is possible to file local applications with priority claims based on foreign applications, as long as the Convention requirements are met. Under Brazilian law, trademarks must be subject to visual representation, so that some non-conventional trademarks are not eligible for registration in the country, including sounds and fragrances. The INPI has adopted several improvements in digital technology in the past few years and almost 100 per cent of trademark applications are currently filed online, and all submissions are available online as well. Similarly, all certificates of registration are now issued electronically, in PDF format, making the trademark department at the INPI a virtually paperless office. It is important to bear in mind that foreign applicants must have a local representative, according to Brazilian intellectual property (IP) law. Therefore, although theoretically title-holders are allowed to file their trademark applications directly, applications filed by foreign companies without local representation will be summarily dismissed. Local representatives must also have the authority to take receipt of summonses from local courts for any disputes arising from IP rights. In addition, Brazilian law stipulates that applicants are only allowed to seek registration for trademarks in the fields of activity in which they are lawfully engaged. As mentioned above, local applications are usually decided in no less than 18 months, in the absence of an opposition. Also, irrespective of oppositions, local examiners undertake an assessment on both absolute and relative grounds. In Brazil, a trademark registration is valid for 10 years, counted from the date of its grant, and may be indefinitely renewed for subsequent 10-year terms. While use is not required for securing a registration, a trademark registration becomes vulnerable to a non-use forfeiture action after five years from the date of its grant. Other types of intellectual property rights are also afforded protection under Brazilian law, and franchisors may benefit from a wide array of legal statutes regulating protection and enforcement of these rights. Brazil is a member of the Berne Convention on copyrights and the Universal Copyright Convention, which require signatory countries to give national treatment to copyrightable works created in other signatory countries (including the United States). Under the Brazilian Copyright Law,3 copyright protection exists by law as of the time the work is created and expressed in any way or fixed in any tangible or intangible support. Copyright registration is not mandatory. The Software Law4 also came into effect in February 1998 and governs software and computer programs. Software is also protected by copyright and although registration at the INPI is not mandatory for property purposes, it is allowed and advisable. The Software Law provides heavy penalties for infringers (including imprisonment and fines), as infringement has been rampant in Brazil. Goodwill is defined in Article 1142 of Law No. 10,406 of 10 January 2002 (the Civil Code) as comprising all the necessary tangible assets (i.e., real estate property and chattels) and intangible assets (all sorts of intellectual properties) duly organised to fulfil the company's activities. Briefly, Brazilian legal doctrine considers the franchisor's trademark the most valuable intangible asset to attract clientele, along with the know-how, trade dress and other particular elements of the franchise system that pertain to the franchisor and will ensure a consistent level of quality of its goods and services. The Brazilian Industrial Property Law also broadly protects the intellectual property assets of a franchise. Pursuant to Article 195 of the Law, it is a crime of unfair competition to disclose, exploit or use without authorisation confidential knowledge, information or data usable in industry, commerce or the providing of services, to which one has had access by means of a contractual or employment relationship, even after the termination of the contract; or to which one has had access by fraud; or where obtained directly or indirectly by illicit means. The Brazilian Consumer Protection Code (CDC) establishes that consumers shall have access to information on existing records, bookmarks, registers and personal and filed consumer data on them, as well as to the sources of this information. Consumer data and records must be objective, clear, true and easily understandable, and may not contain any negative information from any period over five years old. The CDC provides consumers with the right of access to (1) information held in databases; (2) the sources of origin of these records; and (3) to identify the recipients of the content of information maintained in databases. On 30 November 2012, the country's first law on cybercrime was issued. Law No. 12,737/2012 sets out that accessing a third-party computing device, whether or not connected to the internet, in improper violation of a safe mechanism and with intention to obtain, tamper or destroy data or information without the express or implied owner's authorisation, or to install a vulnerability to gain unfair advantage, is a criminal offence, punishable by imprisonment of three months to one year plus a fine. Law No. 12,737/2012 also expressly stipulates that the observance of Brazilian law is mandatory in respect of any operation of collection, storage, retention and treatment of personal data, or of communications data by connection providers and internet application providers, where at least one of these acts takes place in Brazil, including with regard to the rights to privacy, protection of personal data and secrecy of private communications and of logs. Moreover, Decree No. 7,962/2013 regulates the end consumers' rights foreseen in the CDC on e-commerce. In short, the Decree has formalised and confirmed the applicability of existing consolidated principles and case law to the commercial relationship between consumers and providers of services and goods in online transactions. Furthermore, the Decree stipulates that suppliers shall inform consumers in a clear and conspicuous manner how to exercise the right to cancel their online purchase using the same tools available when hiring the services, and that the conditions of delivery, deadlines, quantity and quality set out during the offer shall be honoured and the provider should use effective and safe payment methods and data protection mechanisms, among other obligations and rights. On 14 August 2018, federal Law No. 13,709/2018, the first Brazilian General Data Protection Law (LGPD), was enacted. The LGPD shall apply to any natural or legal person, whether public or private, who performs data collection processing operations in Brazil, aiming to offer the supply of goods or services or simply collecting data of individuals located in the Brazilian territory. The LGPD will not enter into force until the beginning of 2020. Brazilian Law No. 8,955 of 15 December 1994 (the Franchise Law) governs all franchise relationships that are 'established and operated within the Brazilian territory'. 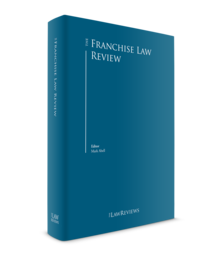 The Franchise Law is not intended to govern the private franchisor–franchisee relationship, but rather to make this relationship more transparent by requiring the franchisor to provide clear and detailed information to prospective franchisees in a written franchise disclosure document (FDD). The FDD does not have to be recorded or registered with any agency and remains a private document between the parties. The FDD must be in clear and accessible terms and must be delivered to the prospective franchisee at least 10 days prior to the execution of any binding document related to the franchise and receipt of any payment. Even when an international franchise agreement is governed by foreign law and elects foreign jurisdiction, the delivery of the FDD to a prospective franchisee is mandatory since the franchise will be operated in Brazil. As mentioned above, the Franchise Law requires the delivery of the FDD, containing information on several aspects of the business, to prospective franchisees at least 10 days prior to the execution of any binding document related to the franchise, or receipt of any payment. Failure by the franchisor to supply the FDD within the terms established by the Franchise Law entitles the franchisee to argue for the nullity of the agreement and the return of all amounts paid to the franchisor or to third parties indicated by the franchisor in the way of the initial fee and royalties, and for the recovery of damages. a draft of the franchise agreement and of any preliminary agreement. to qualify the licensee for tax deductions. In addition to registering the franchise agreement with the INPI, registration of the agreement at the Central Bank is also required for the purposes of remuneration remittances. Although the FDD remains a private document between the parties, for the purposes of registration of franchise agreements with the INPI, the parties are also required to present to the INPI evidence of the receipt of the FDD by the franchisee. In addition, the franchise agreement must bear the signature of the representatives of both parties along with two witnesses. Signatures collected abroad must be notarised and legalised by the local Brazilian consulate. As mentioned above, the Franchise Law is not a relationship law. The INPI's assessment of the registration of franchise agreements tends to focus on the validity of the trademarks in Brazil and the specification in the agreement of their serial number at the INPI. The INPI also verifies whether the licensor is the owner of the licensed trademarks or duly authorised by the owner to license them to third parties. Therefore, the parties should stipulate in the agreement all the terms and conditions of the franchise relationship, including, without limitation, territory, term, payment terms, licensed trademarks, authorised products, conditions for opening an outlet, marketing-related obligations, IP protection clauses, events of termination, consequences of termination, law and jurisdiction. The parties may freely set out the percentage of royalties insofar as it stays within the price range customary in that field and in the national and international market. Payments may be established as a percentage of the net sales or by means of a fixed amount based on each unit produced. Nevertheless, royalties involving related companies such as parents and subsidiaries are limited by the corresponding ceiling of fiscal deductibility specified by Ministerial Ordinance No. 436/58, which varies between 1 per cent and 5 per cent of the net sales price depending on the field of industry involved. Normative Act 70, enacted by the INPI on 12 April 2017, entered into force on 1 July 2017, with the purpose of modernising the industrial property system in Brazil. The new Act substantially limited INPI's power to interfere in the assessment and registration of agreements, as the INPI shall no longer assess the agreements in light of fiscal or foreign exchange regulations currently in force. Before Normative Act 70 was enacted, the INPI had always assessed the applicable maximum percentages for remittance of royalties between affiliated companies, such as parents and subsidiaries. With the issuance of Normative Act 70, the INPI will, from now on, simply indicate in the Certificate of Registration the information stated by the parties, who will be fully and solely responsible in the event of non-compliance with these rules, and liable for any penalties. In Brazil, guarantees from both individuals and companies in connection with franchise agreements are, as a general rule, valid and enforceable. Under Brazilian law, a guarantee is used as a way to secure a debtor's obligation; this security might be provided by real estate or movable property (in rem), or by a person, a third party to the debt–credit relationship (in personam) who will assure the debtor's debt. The in rem guarantees are established in the Civil Code under Articles 1361 to 1368A and Articles 1419 to 1510. They are namely fiduciary property, pledge, mortgage and antichresis. One element that the in rem guarantees have in common is that any clause authorising the creditor to keep the object of the guarantee, if the debt is not paid at maturity, is null and void. The satisfaction of the debt occurs via the proceeds of the sale of the asset given as surety. To that effect, the sale has to follow a specific procedure established by applicable laws. There are certain formalities and registrations required for such guarantees to be valid and enforceable in Brazil. While particular assets of the debtor are assigned under in rem guarantees, under in personam guarantees, all the guarantor's assets might serve to assure the obligation. The in personam guarantees legally permitted in credit–debt relations are the fiança, or surety, and the aval, a specific guarantee used to secure debt instruments. Practice shows that most of the franchise agreements in Brazil use the personal guarantee (usually fiança) to assure franchisor's interests against the franchisee failing to fulfil the debt. As a general rule, this type of guarantee must be executed by the guarantor, its spouse – if the guarantor is married, and in accordance with the 'universal community' or 'partial property' property regime – and two witnesses. According to Brazilian tax law, foreign franchisors that are not registered as Brazilian taxpayers generally cannot be legally liable for taxes due by the franchisee in Brazil. However, if the foreign franchisor maintains a presence in Brazil (for instance, a registered company in Brazil) with Brazilian taxpayer status, the RFB may try to make the franchisor jointly liable for taxes not duly withheld or paid by the franchisee. Notwithstanding this, Brazilian law establishes that the franchisee is an independent entrepreneur who should bear the risks of its commercial activities in their entirety. Consequently, if there is no evidence that the franchisor encouraged misconduct or a violation of applicable laws, the franchisor should not be involved in the tax liabilities of the franchisee, even if the franchisor maintains a presence in the Brazilian territory. Thus, the Brazilian franchisee should be the one responsible for complying with Brazilian tax laws and regulations. If there are no taxes withheld in Brazil, the franchisor will not be authorised to offset any credit against its federal taxes due overseas, in accordance with potential reciprocity treaties or treaties to avoid double taxation executed between the countries involved in the cross-border transaction. Generally, late payment of IRRF, CIDE, PIS-Import, COFINS-Import and IOF/Exchange are subject to the following interest and penalties: (1) official interest, charged at a monthly rate published by the government, until payment; and (2) a daily fine of 0.33 per cent of the tax due, up to a maximum penalty of 20 per cent. Note that tax assessments arising from failure to collect tax are also subject to a penalty of 75 per cent of the tax not paid, while the penalty for fraud is 150 per cent of the tax due. Crimes against the Brazilian financial system are contained in Articles 2 to 23 of Law No. 7,492 of 1986. Accordingly, the remittance of expenses abroad by any means other than through a financing institution duly authorised by the Central Bank, and without payment of taxes due, shall be classified as white-collar crime. Furthermore, within the scope of punitive administrative proceedings pursuant to Law No. 13,506/2017 and Circular No. 3,857/2017, the Central Bank may impose penalties in respect of irregular remittances of royalties to foreign beneficiaries. Moreover, crimes against the Brazilian tax system are contained in Articles 1 and 2 of Law No. 8,137 of 1990. Accordingly, companies' legal representatives or administrators would be held criminally liable for tax evasion and crimes against the economic order if they deceive tax authorities, neglect to provide information or provide false information to tax authorities, provide incorrect or untrue data, or neglect operations of any kind in a document or book required under tax laws. Regarding ISS, in cases of non-withholding, the importer will be subject to a fine of 60 per cent of the value of the tax accrued, subject to interest of a monthly rate of 1 per cent and also to monetary updating in accordance with IPCA-E variation. However, it should be noted that the above-mentioned penalties are specific to Rio de Janeiro and penalties of this nature may vary from city to city. The most tax-efficient structure for international franchising will depend on the particulars of the case, including the corporate structure and tax regime adopted by the parties, location of each party and the specific goals of the parties involved. Therefore, the most tax-efficient structure varies on a case-by-case basis and should be examined from the point of view of both the Brazilian and the foreign jurisdiction, as different laws may affect the conclusion. Note also that the best tax structure may not always represent the most efficient logistical or contractual structure. Although the Civil Code, effective as of 11 January 2003, does not expressly mention franchising (which is subject to the specific Franchise Law – see Section IV.i), it prescribes general rules and principles, such as good faith, that also have to be observed in franchising legal documents. The principle of good faith, which, in legal doctrine and case law, had already implicitly governed the relationship between contractual parties, is now expressly mentioned in Articles 113 and 422 of the Civil Code. This principle provides that the contracts should be negotiated and executed according to what was foreseen, or that both parties should obtain the expected returns or results. Thus, beyond the obligation not to harm, the principle of good faith, as set out in the Civil Code, obliges the parties to cooperate with fairness and honesty during all phases of the transaction, including after its termination. The importance of good faith at the offering stage of a franchise relationship is due to the perceived economic power of the franchisor – who holds the brand, know-how and tested technology – in relation to the potential franchisee, who requires access to the franchisor's information to develop its own business. This is why in franchise transactions the transparency of the information provided by the franchisor, especially at the offering stage, is more relevant than transparency in other contractual relationships in which the parties have the same economic status. On the other hand, this principle also benefits the franchisor to the extent that minor or irrelevant omissions or errors in the FDD that do not affect the transparency obligation, inasmuch as they do not result in a substantial modification of the expected or negotiated conditions, cannot be used to justify a claim by the franchisee of misconduct on the part of the franchisor. The standards implied by the principle of good faith shall subsist through all phases of the transaction, and even survive termination, which means that the contracting parties must observe and act in accordance with these standards not only before and during the term of the agreement, but also after its termination. Agency agreements are ruled by Law No. 4,886 of 9 December 19655 and also by specific provisions of the Civil Code (Articles 710 to 721). This legislation is very protective of the agent, imposing several limitations on the right of the principal to terminate the agreement, as well as pre-established penalties to be incurred by the principal in the event of termination. Therefore, as a general rule, distribution or agency agreements are not to be confused with franchise agreements. In its definition of the franchise relationship, the Franchise Law expressly states that it does not constitute an employment relationship between the franchisor and franchisee. Similarly, under a typical franchise agreement (which presumes no hierarchical subordination of the franchisee's employees in relation to the franchisor), there is no labour relationship between the franchisee's employees and the franchisor. The CDC sets out the joint and strict liability to consumers of all the parties involved directly or indirectly in the supply chain of products and services. This liability does not depend on the existence of fault and the CDC allows the end consumer to file a claim against any of the economic agents that have participated in the circulation of a product or service that has caused harm or has any defect in quality or quantity. Therefore, although there is no consumer relationship between the franchisee and the franchisor, pusuant to the CDC (and also because it is the title holder of the relevant trademarks), the franchisor may be deemed to be one of the agents of the supply chain and thus liable towards end consumers for acts of the franchisee. This understanding is recurrent in claims derived from harm and losses arising from a defect in quality or quantity of products supplied by the franchisor or its designated suppliers to the franchise chain. In any event, even if the franchisor is deemed liable and directed to indemnify end consumers, Article 88 of the CDC grants the franchisor the right of recourse against the franchisee, provided that the claim in question arose from a fault of the franchisee. Law No. 12,529/2012 (the Competition Law), effective as of 29 May 2012, regulates competition in Brazil and establishes rules concerning the abuse of a dominant position. The Competition Law lists those anticompetitive practices that may constitute a breach of the economic order and, therefore, may have an impact on franchise agreements. tying the sale of one product to the acquisition of another or to the use of an additional service. The Administrative Economic Protection Counsel (CADE) is the government body competent to examine and assess conduct that may impair or limit free competition or result in the control of significant market shares. Anticompetitive practices, especially those listed above, are only characterised as such in the event that they are likely to unjustifiably limit competition, concentrate economic power, dominate markets, arbitrarily increase profits or impose abusive practices. In light of the above, CADE considers specific aspects such as the peculiarities of the business, the product or service involved, the size of the market, the commercial sector and the nature of the transaction. Franchise agreements have been considered pro-competitive and the restrictions usually imposed are intended to protect the network. In franchise relationships, covenants restricting competition are typically permitted when they are established in a reasonable manner to ensure uniformity within the franchise network by imposing a single marketing strategy for the whole franchise chain. As mentioned above, the Competition Law lists the anticompetitive practices that may constitute a violation of the economic order and therefore should be considered by the franchisor when enforcing the franchise agreement. As a result, tying provisions – those that fix the price of products commercialised by franchisees, establish supply arrangements or make compulsory the acquisition of certain products because of specific standards of quality – may be considered admissible in the context of the rule of reason. They may be abusive and their validity may be questioned if the restrictions are unduly enforced, without reasonableness, by the franchisor. For instance, extending the franchisee's non-compete obligations to non-competing goods could be construed as anticompetitive practice, depending on the circumstances. Further, the Industrial Property Law, which regulates rights and obligations relating to industrial property, stipulates that where a party discloses, exploits or uses without authorisation confidential knowledge, information or data usable in industry, commerce or the providing of services – except knowledge, information or data that is public knowledge or obvious to a person skilled in the art – and to which he or she has had access by means of a contractual or employment relationship, even after the termination of the contract, this shall constitute a crime of the practice of unfair competition. With regard to exclusive territory, the Franchise Law determines that the FDD must include clear information about the territorial rights granted to the franchisee, particularly: (1) if the franchisee is guaranteed exclusivity or a right of first refusal in any particular territory or activity and, if so, under what conditions; and (2) if the franchisee has the right to sell or render services outside its territory or provide such services outside Brazil. Therefore, there are no restrictions on granting territories whether exclusive or non-exclusive in Brazil. Non-compete covenants are very common in franchise agreements, in which the maintenance of the strictest loyalty and good faith between the parties is essential, especially as the agreements involve the disclosure of confidential privileged information and know-how regarding business techniques and methods. Although the Competition Law establishes that any act that obstructs the establishment and operation of businesses in the local market is an infringement of the economic order, contractual clauses or covenants that prohibit franchisees from competing directly or indirectly with the franchisor during or after the term of the franchise agreement should be legally valid and enforceable because of the special features of a franchised business. The validity of such contractual clauses should be questioned when their effects lead to dominance in a relevant market for products or services, arbitrarily increase profits or lead to abusive control of a dominant position in the market. In addition, covenants limiting competition must always specify a duration and a specific territory in which the non-competition obligation applies. However, regardless of the foregoing concerns, the courts have been upholding such contractual clauses and covenants. In-term covenants not to compete are considered natural in franchise agreements and may be agreed by the parties for the entire duration of the agreement and renewals. Their enforcement is usually fairly simple, provided that evidence of any violation clearly shows the franchisee's participation in the infringement. As with in-term non-compete provisions, mentioned above, post-term non-compete clauses should also be enforceable under certain circumstances. Brazilian courts have been enforcing post-term non-compete covenants when they specify a duration, generally from two to five years, and a specific territory, which may be the same city or even the same state as that in which the franchised unit is located. Franchisors may also restrict their franchisees' ownership interests in competitor companies, provided they can justify such restrictions as necessary for the maintenance of the quality of the franchised network and the products or services offered by franchisees, and for the protection of trademark goodwill and, most importantly, trade secrets. Brazilian law provides for specific performance of post-term non-compete covenants in circumstances where the franchisor can demonstrate that the breach of such a covenant is a result of a franchisee's behaviour. Injunctions are easier to obtain with respect to breaches of in-term non-compete covenants, although post-term restrictions are also enforceable. As well as injunctions prohibiting the conduct of the competitor business, a remedy available to the franchisor for breach of these provisions is to assert a claim in court (or through arbitration) for damages. Furthermore, as mentioned above, under the Industrial Property Law, where the franchisee discloses trade secrets, the leakage or misuse is actionable as a crime and civil tort. Therefore, the violation of a valid and enforceable non-compete covenant may be considered not only a material breach under the franchise agreement and a violation of the principle of good faith, but also as a crime of unfair competition, depending on the details of the case, and a civil infringement. It is possible under the Brazilian legal system for the franchisor to take over the franchisee's business. However, the franchisor's ability to do so will depend on the provisions of the underlying franchise agreement. The contracting parties must set out the terms and conditions under which such a takeover can occur. The terms of the relevant lease agreements should also be taken into consideration, to ensure that the agreement between the franchisor and the franchisee will be effective thereunder. Franchising is understood as an intuitu personae relationship and, therefore, it is very common and broadly accepted that, under the relevant franchise agreement, the franchisor imposes certain limitations on the franchisee's shareholdings in local businesses, especially in connection with changes of control or transfers of equity interest that entail a change in the administration and guidance of the franchisee company. These limitations should be reflected, as much as possible, in the franchisee's articles of association or by-laws. There is no specific restriction on the franchisor taking over the local lease of the former franchisee. However, this aspect must be clearly defined in the franchise agreement and the relevant lease agreement so that, from the outset and commencement of the lease, the landlord agrees to the assignment of the premises to the franchisor in the event of termination of the franchise agreement. We usually recommend that a provision such as this in the franchise agreement ensures the right of the franchisor to take over the lease directly or to appoint a new franchisee or licensee to do so. This provision assists the franchisor in ensuring the continuity of the business at the same location and avoids the conversion of the business into another brand or operation. Although there are no special anti-corruption and anti-terrorism regulations related to franchising, fraud, corruption and money laundering are crimes under Brazilian law. Brazil's anticorruption law, Law No. 12,846/2013 (the Anticorruption Law), enacted on 1 August 2013, entered into force on 29 January 2014 and imposed civil and administrative liability on legal entities for corrupt acts committed by their employees or agents against foreign or domestic public administrations. In fact, under the Anticorruption Law, legal entities and individuals involved in corrupt activity face liability. Unlike the FCPA, which requires proof of corrupt intent, the Anticorruption Law stipulates strict liability for legal entities, regardless of fault. The Anticorruption Law prohibits companies from offering or giving (through their directors, officers and employees or through external companies or individuals) an unjust advantage to a domestic or foreign public official or to a related third party, or from financing or subsidising conduct of this nature. Forbidden conduct includes the actual payment and provision of any undue advantage to any public official or third party, including acts of offering, promising, sponsoring or supporting activity of this nature. The Anticorruption Law imposes penalties for violations: fines may be up to 20 per cent of the company's annual gross revenues and, if gross revenues cannot be determined, fines range between 6,000 and 60 million reais. The Anticorruption Law also establishes that information regarding companies penalised for violations will be published in newspapers of wide circulation, with the companies listed as having been penalised or as being disreputable companies. Brazilian public entities may also file civil lawsuits requesting return of funds, assets or rights obtained, to recover the losses suffered by the public treasury in relation to the benefits directly or indirectly obtained by legal entities or companies. Such lawsuits may also lead to sanctions that range from the suspension of a company's activities or its public loans to the complete dissolution of the company (known as the 'death penalty' for legal entities). Finally, Brazil's Anticorruption Law also recognises the value of corporate compliance programmes and expressly stipulates that the existence of corporate governance and integrity mechanisms (such as internal audit controls, training, hotlines and the effective application of codes of conduct) will be taken into account to attenuate penalties. For compliance purposes, the qualifying definition of an integrity programme is set out in Chapter V of Decree No. 8,420, enacted in March 2015. Law No. 9,613/1998 stipulates that money laundering is a crime and Law No. 13,260 of 16 March 2016 determines that terrorism (as defined therein) is also a crime. Mediation is a recognised form of alternative dispute resolution, but is not mandatory. However, the New Civil Procedural Code (NCPC) strengthened extrajudicial settlements by stimulating such mechanisms as mediation and conciliation. In this context, with a few exceptions, the NCPC establishes that in civil lawsuits the defendant will be summoned to appear before a conciliation or mediation hearing, which will take place without the judge, to facilitate negotiation and settlement. Moreover, Brazil is a signatory to and has ratified6 the New York Convention of 10 June 1958 on the Recognition and Enforcement of Foreign Arbitral Awards. As a result, a court in Brazil is likely to honour a decision to use the international arbitration dispute resolution procedure, and would therefore refuse to hear any disputes arising under a franchise agreement. The Brazilian legal system accepts the adoption of foreign law and jurisdiction, or arbitration. However, foreign decisions, including foreign arbitration decisions, must go through a process of assessment by the Superior Court of Justice to be locally enforceable. Approval of the decision by the Superior Court is required to obtain the exequatur necessary to have local courts enforce the foreign court or arbitration decision. This homologation procedure currently takes from two to 24 months, if the decision complies with all the procedural requirements of the rendering country. Once homologated, the decision is forwarded to the federal court in the state where the defendant has its headquarters, to begin the enforcement procedure, which usually takes from four months to two years, depending on the complexity of the case. to receive the exequatur from the Superior Court of Justice, the foreign decision cannot be contrary to Brazilian public policy and sovereignty. It is common therefore to carve out in the contract some issues, especially in relation to intellectual property, unfair competition and non-compete covenants, and in respect of which the franchisor may elect to apply for preliminary injunctions directly in Brazil through the courts. Furthermore, it is recommended that the choice of law corresponds to the jurisdiction. The risks of confusion in having the judge of one country apply another country's law are too high. Additionally, the advantages of selecting Brazilian law and jurisdiction would be to avoid delays in serving process on the franchisee (avoiding the requirement of letters rogatory and the need to go through the enforcement procedure for foreign decisions at the Superior Court of Justice). Also, since there are no relationship laws regarding franchising, the agreement is the main source of information as to the terms and conditions of the grant of the franchise. Brazilian law therefore provides a fairly liberal environment for franchise agreements. Brazilian judges are used to dealing with preliminary injunctions on an expedited basis. Therefore, the adoption of local law should be considered the more efficient option. The previous Code of Civil Procedure provided that the Brazilian courts had jurisdiction when: (1) the defendant was domiciled in Brazil, whatever his or her nationality; (2) the obligation was to be performed in Brazil; or (3) the actions resulted from an occurrence, or act performed, in Brazil. The NCPC, effective as from March 2016, brought a new perspective. While the NCPC recognises that there is a simultaneous jurisdiction if the obligation is to be performed in Brazil, the parties are fully able to elect which jurisdiction they shall submit to, pursuant to the NCPC. Thus, it is an effective argument to be brought by defendants in proceedings filed in Brazil, and it might cause the Brazilian courts to decline jurisdiction over the case and might present a greater chance to apply the law elected by the parties. There is no specific procedure for franchising disputes; they are governed by the general rules of the NCPC and other applicable legislation regarding court proceedings and arbitration. Preliminary injunctions may be obtained ex parte if the risk of harm in waiting for a final judgment is demonstrated and the party presents sufficient evidence that its claim is well founded. However, because under Brazilian law companies are considered to play a highly relevant social role (as they generate revenue, pay taxes and provide jobs), it is uncommon to obtain an injunction to enforce non-compete provisions. Further, criminal search-and-seizure orders to gather all confidential material, products bearing the trademarks and marketing materials, as well as to remove all franchise-related elements, such as colour schemes and signs that characterised the site as franchised unit, may be granted on an ex parte basis, if the serious risk of harm in waiting for a final judgment is demonstrated, and the party presents enough evidence that its claim is well founded. Although it is not possible to state precisely the length of time this procedure may take, we estimate that an injunction can be obtained within one week. An interlocutory appeal filed in Rio de Janeiro9 against a plea for change of venue filed at a lower court instance was rejected on 2 May 2012. In the plea, one party claimed that the lawsuit had not been filed at a court of competent jurisdiction, according to the franchise agreement's choice-of-jurisdiction clause. According to the appellant, the choice-of-jurisdiction clause should not be deemed valid since the franchise agreement should be considered an adhesion contract, which does not allow for choice of jurisdiction. However, the decision dismissing the interlocutory appeal stated that the clause of choice of jurisdiction in a franchise agreement shall not be considered abusive if the franchisee is not able to prove that the franchisor is in a favourable position as regards economic and technical aspects of the franchisor–franchisee relationship. Another important precedent decision was rendered on 3 June 2013 at the Civil Court of Appeal of Rio de Janeiro10 against a first-instance decision that was unfavourable to a franchisee. In short, the franchisee claimed that its business failure was due to a lack of clear information about the franchise system in the FDD, which did not observe all the strict requirements of the Franchise Law. The appeal was only rejected because of lack of evidence of the damage caused to the franchisee effectively through the lack of information in the FDD. The precedent decision expressly recognised the importance of examination of the evidence, which must substantiate an economic and financial imbalance in the franchise agreement and its correspondence with a lack of clear information in the FDD. An interlocutory appeal was filed at the Civil Court of Appeal of Rio de Janeiro11 against the rejection of injunctive relief sought at first instance for the cessation of undue use of a franchised trademark by the illegitimate assignee of a franchise agreement. The interlocutory appeal was accepted on 24 July 2012, granting the injunctive relief for cessation of use of the trademark by the illegitimate assignee of the franchise agreement, on penalty of a daily fine for non-compliance. The decision recognised the enforceability of a clause in the franchise agreement prohibiting the assignment by the franchisee of the franchise agreement to a third party without the franchisor's prior consent. The higher-instance court recognised that the assignment of the franchise agreement was void and that the assignment could cause significant damage to consumers and to the reputation of the trademark, which was considered well known in its business segment. An appeal was filed at the Civil Court of Appeal of Rio de Janeiro12 against the lower-level instance, which had denied the payment of damages sought by the plaintiff. In short, the customer, a young child, was hit by a piece of a toy, inside a franchise unit of a well-known franchise chain, and the child's legal representative filed a lawsuit against the franchisor asking for damages to compensate the moral damage suffered by the child. The franchisor presented the defence that it was not the legitimate defendant, since the fact occurred inside the franchise unit of a certain franchisee. However, the franchisor was deemed a legitimate defendant by the higher court, which accepted the appeal and ordered payment of compensation in the amount of 2,000 reais, plus interest and updated to reflect inflation rates since the trial date, because of moral damage caused to the plaintiff. Draft Bill No. 219/2015 (the Draft Bill), which is intended to revoke the current Franchise Law, is running its legislative course and is currently being assessed by the Committee on Economic Affairs. The Draft Bill aims to regulate the legal institution of franchises, and not just franchise agreements. It also replaces terms such as 'trademarks and patents' with 'intellectual property' – a broader concept. Furthermore, it establishes that the amount to be paid by the franchisee to the franchisor in the case of sublease of commercial real estate might be higher than the rent the franchisor pays to the landlord, if this is expressly stated in the FDD. Another relevant matter is the possibility of public companies, directly or indirectly controlled by the union, states, federal district and municipalities, adopting franchise systems, provided that the Brazilian Bidding Law13 and relevant public bidding process are duly observed. A public company adopting a franchise system would have to disclose the FDD in a daily newspaper in the state where the franchise was offered. 1 Luiz Henrique O do Amaral is the managing partner, Cândida Ribeiro Caffé, Rafael Atab de Araujo, Luciana Gonçalves Bassani, Mariana Reis Abenza and Fernanda Souto Pacheco are partners and Juliana Bussade Monteiro de Barros is an associate at Dannemann Siemsen Advogados. 2 Associação Brasileira de Franchising; https://www.abf.com.br/. 5 Law No. 4,886 of 9 December 1965 (amended by Law No. 8,420 of 8 May 1992 and Law No. 12,246 of 27 May 2010). 6 Decree No. 4,311, dated 23 July 2002. 7 Further information: https://www.abf.com.br/beneficios/mediacao-e-arbitragem/ http://www.csd-abpi.org.br/defaultabf.asp?identifier=ABF. 8 Article 403 of the Civil Code. 9 Appeal No. 0011368-84.2012.8.19.0000 filed at the 11th Civil Court of Rio de Janeiro. 10 Appeal No. 0375549-57.2008.8.19.0001 filed at the 9th Panel of the Civil Court of Appeal of Rio de Janeiro. 11 Interlocutory appeal No. 0004862-92.2012.8.19.0000 filed at the 12th Panel of the Civil Court of Appeal of Rio de Janeiro. 12 Appeal No. 0120429-47.2007.8.19.0001 filed at the 10th Panel of the Civil Court of Appeal of Rio de Janeiro.